On Via della Fortuna, a short distance from the House of the Faun heading towards the Porta di Nola gate, we find a house named after the large and evocative fresco on the garden wall depicting a mountain landscape where an ancient hunt for wild beasts is in progress. 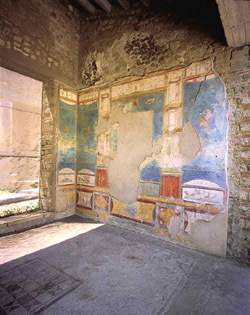 It is a house of Samnite origin and contains some fine example of fourth style decoration. Personifications of autumn and winter are depicting on the walls of the second cubiculum on the right portray mythological subjects. On the left we can see Leda and the Swan, portrayed amid medallion with the busts of Jupiter and Diana and, on the right, Venus fishing between Mercury and Apollo. In the tablinum we find Nile landscapes with Pygmies, cherubs hunting wild beasts and a highly effective depiction of carpets and pieces of cloth billowing in the wind. The exedra opposite the garden is embellished with fantastic architectures and lavish ornamental motifs in which we can see Diana bathing as Actaeon watches, and Apollo in the background with a shepherd.